Classified as a glacial pothole created thousands of years ago, Lake Isaac Waterfowl Sanctuary serves as an important refuge for migrating waterfowl. The surrounding woodlands provide habitat for red foxes, mink, deer, opossum, and countless other animals. It is one of the most active wildlife corridors in Cuyahoga County. A 1.2 mile hiking trail follows through this corridor, passing through wetlands, woodlands, a pine plantation and an orchard while providing an overlook of the floodplain of Baldwin Creek. 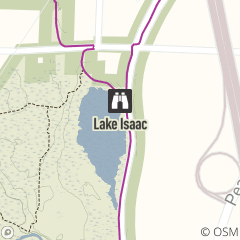 Lake Isaac is a key juncture in Big Creek Reservation, providing access to 8 miles of All Purpose Trail and it is the southern end of the 2.4 mile Lake to Lake Trail. Lake Isaac Waterfowl Sanctuary is located on Big Creek Parkway just south of Fowles Road in Middleburg Heights. Warmer weather in June allows for more comfortable exploring.